RCL continues to enjoy the certification under ISO 9001 for its consistent quality. This stands ample testimony to the conscious efforts undertaken by the management to adhere to its quality policy – “Customer satisfaction is the prime objective of Regency.” RCL has received ISO 14001 certification consecutively and was accredited with environmental management system (EMS) certification by DNV, Netherlands. RCL was also accredited with OHSAS 18001 certification for undertaking the excellent safety measures in the plant. 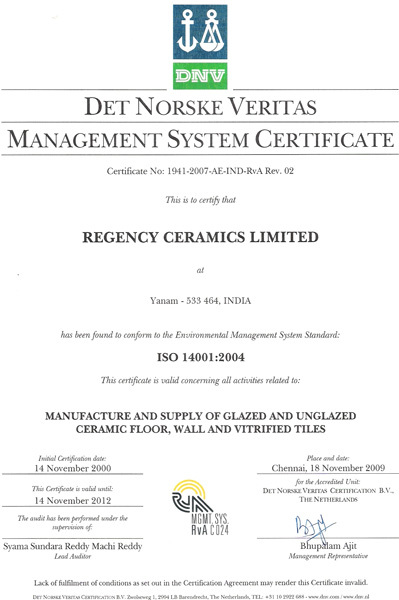 This certification is first of its kind given to Regency in the ceramic industry. 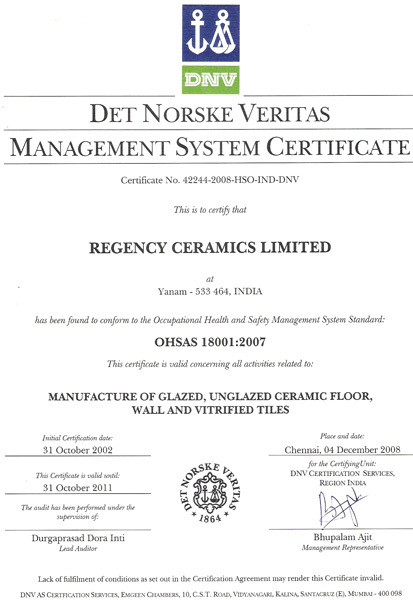 Manufacture and supply of consistent quality Ceramic Floor, Wall and Vitrified Tiles meeting customer requirements. Design and development of new products through on-going research and keeping abreast of trends in ceramic field. Prevention of pollution through conservation of natural resources and minimizing waste generation. Prevention of injury and ill health through strict adherence safety and health procedures and practices by continual improvement of OHS Management. Minimizing Occupational health and safety risks through practicing safe working methods. Continually improving the effectiveness of management systems. Involvement of work force at all levels of the organization.